Niki Lauda moved to within 1½ points of McLaren team-mate Alain Prost thanks to his victory in the British Grand Prix at Brands Hatch. It was a stop-start affair as the race was stopped after 11 laps because of two accidents and only resumed after an hour's delay. The weekend started with a crash as well, as Johnny Ceccotto suffered a mighty accident just seven minutes into the first free practice session on Friday morning. He crashed his Toleman at Dingle Dell and suffered severe leg and ankle injuries that ended his F1 career, although he did return to touring car racing two years later. Nelson Piquet took pole and led into Druids, but behind him there were a series of collisions. Riccardo Patrese's Alfa Romeo slewed sideways and was hit by the RAM of Philippe Alliot which launched itself over Patrese and landed on the second Alfa Romeo of Eddie Cheever. 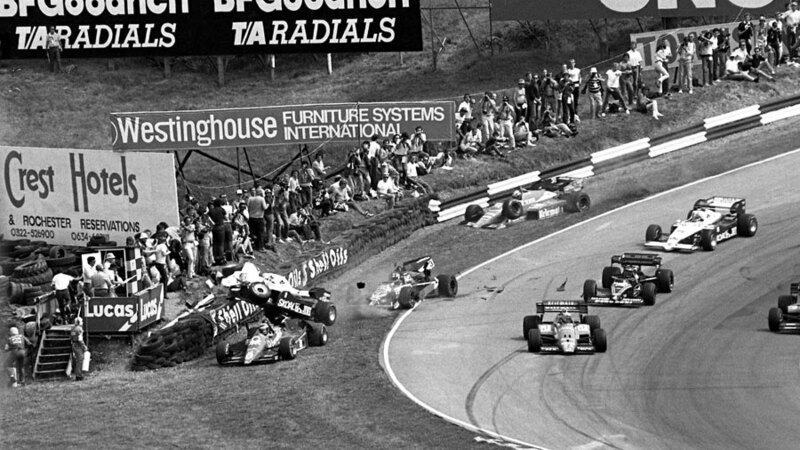 Stefan Johansson, deputising for an injured Martin Brundle at Tyrrell, was also involved. Piquet led Prost after one lap but the Brabham's tyres soon deteriorated and Piquet pitted on lap 11. That caused him to drop down the field but he was thrown a lifeline straight after, when Jonathan Palmer crashed his RAM at the same spot of the earlier incident. Palmer's car caught fire and with so much debris the stewards stopped the race. The grid positions for the eventual restart were calculated on where cars were at the time of the stoppage which meant Prost was in pole. Only 19 of the original 27 starters resumed and the remaining 60 laps were led by Prost and Lauda with Prost pushing hard to open a gap. His gearbox eventually failed, allowing Lauda into the lead with Piquet also in trouble when the Brabham-BMW began to suffer from fluctuating turbo boost. That meant that he struggled home in seventh place with Derek Warwick taking second for Renault and Ayrton Senna third for Toleman. Lauda's win took his total points haul to 367½, surpassing the record held by Jackie Stewart.